An important part of driving safely is making sure your car is always in tip-top shape. One major pointer for driver safety is to make sure the brakes of your car function properly. When you hear that tell-tale squeak when you hit the pedal, you know it’s time to consider fixing brakes on your ride. Change the Pads – Changing the pads to ones made from a different type of friction material such as ceramic or metallic pads can stop the noise. Spray the Pads – A quick spray of a simple aerosol, which is sold at most auto parts stores, can reduce squeaking by spraying it on the brake pad’s friction material. Add a Shim – Adding some Teflon shims to decouple the piston from the pad can stop squeaking brakes. Be sure to place the shim between the brake pad and the caliper’s hydraulic piston to be effective. 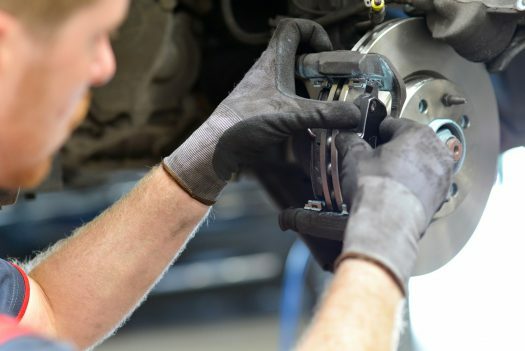 Make Some Adjustments – Coating the back of the brake pad’s backing plates with brake grease will give a quick but temporary fix, as it will wash away eventually due to rain and road dirt. If driving safely is a priority for you, consider a driver safety class at an accredited online traffic school. Take advantage of our free express registration and get going in less than one minute. Get started with your defensive driving course today!